Kerala fish curry have many varieties. Karimeen Mappas is a traditional fish curry in India, Kerala. Karimeen is A.K.A Pearl spot or Green Chromide. “Meen” is a name used for fish in Kerala. Mainly, Mappas is a vinegar saturated coconut milk curry prepared with fish or meat as the main ingredient. For making this recipe, first fry the fish lightly and then cooked in coconut milk. It is one of the most popular curry during Christmas in Kerala. It is a perfect combination with rice, bread, appam, puttu etc. 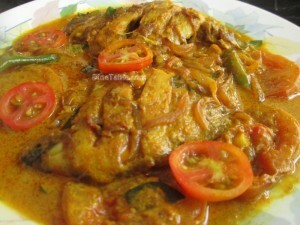 Try this spicy Karimeen curry and enjoy! Clean the fish with water and salt. Marinate the cleaned fish with turmeric powder, chilli powder, pepper powder, vinegar and salt. Keep it aside for 10 minutes. For making Thick and thin coconut milk: Thick coconut milk - Using a mixer grinder grind 2 cup of grated coconut with 2 cup of water for 2 minutes. Take a strainer and strain the coconut milk to a vessel. Thin coconut milk - Take the remaining strained coconut and grind it for 3 minutes and strain that coconut milk to another vessel. Keep it aside. Preparation of Cashew nut paste: Using a grinder grind 10 nos of cashew nuts with 4 tsp of water for 4 minutes and keep it aside. Heat the coconut oil in a pan and shallow fry the marinated fish. It should be half cooked only. Take out the fish from the coconut oil and keep it aside. In the same pan add cardamom, cinnamon and cloves for 2 minutes. Add chopped ginger, chopped garlic and saute for 3 minutes. Add sliced onion and green chilly then saute it till the onion becomes soft. After 5 minutes add the sliced tomato then pepper powder and cook till the tomato becomes soft. Add medium thin coconut milk and salt. When it boils add the fried fish. Cover and cook in a low flame for 10 minutes. Add cashew nut paste and add thick coconut milk to the curry and stir well. Do not let the curry boil after adding the thick coconut milk. Turn off the heat and cover it with a lid. Tasty Karimeen Mappas is ready.